Home Chakras and emotional patterns. One of the things that I often wonder at after my meditation is how odd it is that there are whole parts of my body that my awareness barely frequents. I observed, for instance that there are certain parts of my head, chest and feet that I can feel instantly as soon as I think of them, and others that I only feel after intense concentration. It makes sense that certain feelings would burn the hottest as they are the ones that push you to act. To proclaim your love, to do more of what made you feel pride or happiness or to act out your anger. But what is most interesting to me is the potential relationship between this heat map and the eastern concept of chakras. Chakras are energy vortices located along the human body. There are seven major chakras running from the base of the spine, to the top of the head. Each is responsible for different feelings and different body functions. If a certain chakra center is overactive or underactive for a prolonged periods of time, disease is likely to manifest in the body. A person that has been depressed for a long time, is likely to have chakras that are underactive and do not receive enough heat or energy (as is shown in the image above). People experiencing envy and contempt, allow little energy to circle their bodies as they withdraw into their heads. People experiencing love and happiness seem to be the most balanced and charged. 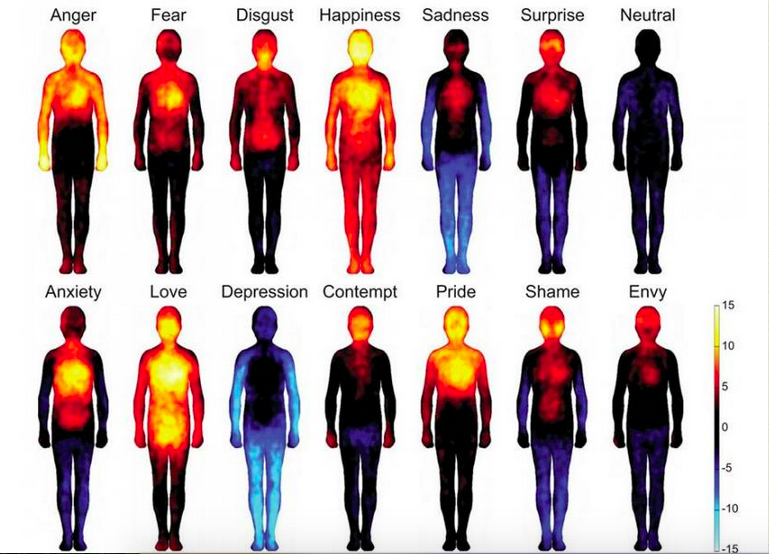 If I am correct, then people could start using heat maps to identify which parts of their bodies could be suffering from their emotional patterns. They could then more objectively identify which chakras they should focus on in their healing. What do you think? Life expectancy vs lifestyle choices.